"There is a list of the 40 principles listed in the order they are most frequently used in problem solving that I use in my workshops. I do not know the origin of it, but in my 10 years of TRIZ work, I believe it is approximately correct." The differential is a key mechanism for providing vehicular stability and mobility. A variety of differentials are built and used in sport utility vehicles (SUV) and recreational vehicles. Problems exist with the current differentials available on the market; the industry requires better solutions. This article explains the function, structure and types of differential mechanisms. 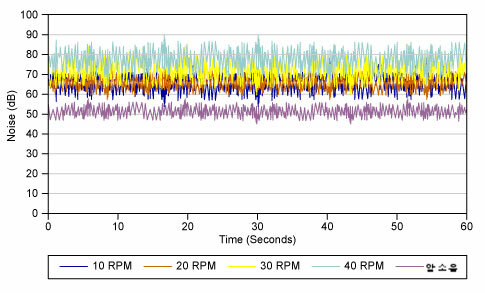 In addition the authors have provided a glimpse at a new design with a detailed three-dimensional CAD (computer aided TRIZ-based design) model followed by a CAE (computer aided engineering) analysis with verified test results. The authors used the Theory of Inventive Problem Solving (TRIZ) to evaluate a simplified ideality of a new design. Maximizing engine power in diverse road conditions is a concern in automotive engineering, because losing power significantly affects vehicular stability and mobility. While stability and mobility are critical for all drivers, they impact "off-road" drivers more. Mobility is especially important in modern sport utility vehicles (SUV) and recreational vehicles (RV), which combine the towing capacity of pickup trucks, the passenger-carrying space of minivans, or station wagons with on and off road capabilities. Stability and mobility are important while driving in the city and both are impacted when the driving wheels simultaneously encounter different road surfaces вЂ“ one wheel on ice and the other on asphalt. When this occurs, the wheel on the slippery surface spins faster than the wheel on asphalt. Most drivers know from experience that applying more engine power to the wheel is useless, because the spinning will worsen. Power must be directed to the wheel with better traction to increase mobility. Unfortunately, it is impossible with a standard (open) differential unit, which is designed with equal torque distribution to both drive axles. Specially built differentials like limited slip differentials (LSD), automatic lockers (mechanical locking differentials), on-command lockers and spools may solve the problem. These units all have advantages and disadvantages, and buyers should select a differential based on their potential driving conditions. For city driving combined with off-road driving the LSD is a good choice вЂ“ it requires minimal attention from the driver, is easy-to-maintain, is simple in design and fits most general driving requirements. 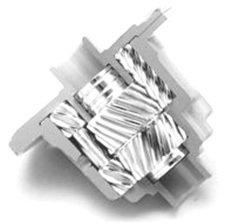 The LSD also has some major weaknesses вЂ“ it wears out quickly, is noisy and can be unreliable. Using these weaknesses as a platform, the authors developed a new evolutionary cone type LSD that uses modern technology to eliminate existing problems. When a vehicle negotiates a turn the outside wheel must travel farther and turn faster than the inside wheel. Pinion gears (Figure 1) allow the outside wheel to turn faster than the ring gear, while the inside wheel turns slower than the ring gear. The net sum of the speed of the two wheels is twice as fast as the ring gear вЂ“ if the outside wheel is turning 5 rpm (revolutions per minute) faster than the ring gear, the inside wheel is turning 5 rpm slower than the ring gear. This differential action is simple in a standard differential and normally the unit functions well, distributing power to both driving wheels. When a vehicle with a standard differential encounters a loose traction surface it directs power to the wheel with the least resistance. The wheel on the loose surface then spins, while the wheel with better traction remains still. A standard differential is designed to provide equal force to both sides вЂ“ if a wheel on either side loses traction, the other side also suffers.1 If, for example, the left wheel loses traction and cannot provide resistance back to the differential side gear, then the right side gear cannot transfer force to the right wheel to counteract the slipping left wheel. 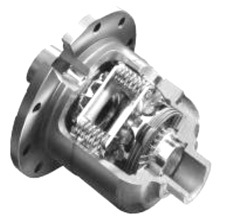 An open differential provides equal torque to both sides; not equal speed. Figure 2 outlines the differential mechanism under normal conditions. In this diagram driving torque is equally distributed between the left and right drive wheels. The reaction torque, which is a function of the tire rolling radius, down-force and friction coefficient of the surface, determines the proportional driving torque that can be applied to the driving wheels. A vehicle has stable or neutral handling when the driving torque on the wheel does not exceed the reaction torque. TRIZ users define problems as either technical or physical contradictions. Sometimes it is difficult to find a solution for a defined technical contradiction. If this occurs, an engineer can reformulate the problem as a physical contradiction and find a solution utilizing suggested principles along with physical effects and phenomena. The purpose is to identify the characteristics of the desired and undesired results. These characteristics define the physical contradiction. The authors have attempted to use both technical and physical means to define the problem. The differential unit has several characteristics that may be considered technical contradictions: a simple design; cheap to build; easy to repair/replace; long life; good for handling in straight-ahead driving and cornering; less tire scrub; supplies equal torque; directs power to the slipperiest wheel at all times; impossible to redirect more power to another wheel with better traction; cannot stop the wheel from spinning; almost useless in off-road and abnormal conditions. Improving stability decreases mobility: if the drive wheels rotate independently maneuvering is easy, but during abnormal or off-road conditions the vehicle will get stuck. Improving mobility decreases stability: if the drive wheels are locked together (a solid axle), both driving wheels will have equal power and the vehicle will not get stuck, but the vehicle is extremely difficult to maneuver. Technical contradictions could also be transformed into physical contradictions and reformulated as: "The axle must be "solid" to have maximum traction and avoid spinning, at the same time the axle must be "non-solid" (open) to allow independent tire rolling and easy handling." Figure 3 is a graphical representation of the problem with an open differential. Although braking is often instantaneous and instinctive, it can significantly vehicle's a vehicle's stability and may have catastrophic consequences. Therefore, braking is not always the correct response for a driver. While stalling the forward inertia/movement of the vehicle relieves or prevents the immediate loss of stability, it may not be enough to restore complete stability. If, for example, a drive wheel suddenly hits a slippery-surface вЂ“ gravel, mud, ice, etc. вЂ“ stability is immediately compromised and the driver must work hard to maintain control of the vehicle to avoid an accident. The situation changes if a vehicle gets stuck (Figure 4) and loses traction. The engine is still capable of producing enough driving torque, but it is limited by wheel's loose wheel's reaction torque. The standard differential continues distributing engine torque equally, but the power is not enough to move the car. Increasing power results in the right wheel spinning uselessly. a) Make the characteristics of an object or outside environment automatically adjust for optimal performance at each stage of the operation. b) Divide an object into elements capable of changing position relative to each other. c) If an object is immovable, make it movable or interchangeable. Replace solid parts of an object with gas or liquid. These parts can use air or water for inflation or use air or hydrostatic cushions. The no-slip differential (NSD) evolved from the implementation of these different ideas. Separating the requirements solves the physical contradictions. Consider the four main separation principles: in space; in time; within a whole and its parts; upon condition(s). To resolve physical contradictions in the open differential, the concept of "separation upon condition" could be employed. This concept of separating opposing requirements of a condition(s) can resolve contradictions in which a helpful process takes place when special conditions exist. The application of selected physical effects and phenomena can also be used for generating inventive solutions as shown in Table 1. Today many differentials utilize TRIZ inventive principles. The mechanical locker, commonly referred to as a NSD, serves as an example of a solution. An example of a NSD traction system is shown in Figure 5. The NSD differential locks the rear axles together creating a solid axle that is locked and will not lose traction. Both wells rotate regardless of the road surface and maintain maximum power. The NSD appears to be a good solution, and the manufacturer describes it as smooth with no ratcheting sounds. The differential unlocks slightly while cornering so the outer wheel can roll faster. Independent sources claim that during a corner, when the differential differentiates (separates and unlocks) it sends all power to the inside wheel trying to force the vehicle straight ahead. When a driver presses the throttle the car goes into an "under steer" condition and can result in a loss of control during inclement weather.The NSD should, therefore, be reserved for serious off-road driving where a locking differential is the only way to avoid getting stuck and remain mobile. The LSD (limited slip differential) was primarily designed for on-road and light duty off-road applications. The LSD solved harsh cornering problems while sacrificing traction capabilities. The traction deficit was not an issue, however, because there is no need for constant traction within a city. Limited slip differentials are not the ideal solution. Side effects include increased friction during cornering. Unnecessary friction shortens the lifetime of the friction components and eventually the LSD becomes an open differential. An LSD is the same device as a standard differential with the exception of an additional function вЂ“ it provides more power to the wheel with better traction when the wheel begins to spin. It modifies the load-equalizing action with a certain amount of speed-equalizing action enhancing vehicle mobility and stability. The basic working principle of the LSD is the same as the open differential вЂ“ torque generated by the engine is transmitted to the ring gear, which is bolted to the casing. 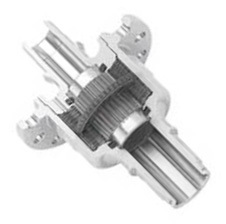 In turn, the casing transmits the torque to the side using spider gears connected to the casing by a pinion shaft. The side gears are splined and turn with the drive axles. Torque from side gears is transmitted to the wheels through these splined axles as shown in Figure 6. The unique element of the LSD is its torque biasing mechanism that cannot be found in a standard differential. The torque biasing mechanism differs among limited slip differentials: springs (Belleville springs, coil springs or leaf springs) with the friction discs, helical gear sets, plates for fluid shearing, etc. Limited slip differentials can be categorized into two groups: mechanical and fluid based.3 In the mechanical group clutch packs, cone, and cam or helix gears are mostly used and in a fluid-based group, the viscous coupling LSD is used (Figure 8). Both units perform the same task. 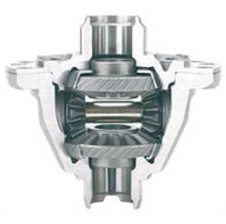 The differential cases are similar to standard cases except for a large internal recess in the area of each side gear. This recess accepts either a clutch pack or a clutch cone depending on design. The clutch pack consists of clutch disks and plates.4 The clutch discs are splined to the side gear, and the clutch plates are tanged and fit into the case. The discs rotate with the side gear and the plates with the differential case. In the other unit, the cone is splined to the axle shaft, and it rotates with the side gear only. A preload spring or springs provide the necessary clutch pressure to provide drive to both wheels during unequal traction. The spring tension is low enough to allow clutch slippage on the inner drive axle when turning corners. The helix gear is used in certain LSDs.4 Helical gear sets will determine the torque on each side automatically and control the torque bias ratio (TBR) according to design specifications. The goal of this development project is to improve quality/reliability and reduce the cost of an existing cone type LSD. The authors needed to identify the parameters increasing cost and affecting the quality/reliability of the existing product. The introduction of a new principle creates a secondary problem вЂ“ if the secondary problem is easier to solve than the original problem, progress has been made. Historically there have been many problems: the benchmarked LSD biased the torque to the wheel with better traction; when one wheel started to spin the clutches were pushed by the side gears toward the casing; clutches have direct friction contact with the differential casing and are made of special alloyed metal with good resistance and friction characteristics; the wear of casings and cone clutches make them impossible to partially replace; when clutches are engaged they chatter; to avoid chatter special oil additives are used. Once recorded, several contradictions emerged within the history. Two desired improvements include increasing quality/reliability and decreasing the costs. There are several degrading parameters associated with each improvement. Tables 2 and 3 contain information taken from the intersections of the relevant parameters on the contradiction matrix. At times, there are not any parameters that come close to phrasing the formulated problem. Representing contradictions as a combination of two of 39 parameters requires a broad interpretation of the parameters. A tally of principles used in all contradictions suggests looking at those that occur most frequently. The top five are listed in Table 4. Principles 35, 10 and 1 are the most frequently used in this step-by-step process as is typical throughout contradiction matrix analyses. Resource analysis is another useful tool to help avoid overlooking the free resources within the environment of application. The available resources shown in Table 5 may help solve problems. Analysis of the possible contradictions for the newly developed cone type LSD showed 82 inventive principles. The results confirm that most of the suggested principles are used in the new product. The newly developed LSD is composed of a case, pinion and side gears, pinion axle, spacer, pin, pinion thrust washer, cone-type friction ring, Belleville springs and an adjustable pin as illustrated in Figure 9. The friction ring is a key element of the LSD. See Figure 10. It is made of a cheaper material (principle 27) and there is no friction contact with the differential casing. Therefore, it is possible to replace only the friction ring or side gear (principles 34, 1). Belleville springs provide preloaded force and are placed between the friction ring and the case (principle 24). To improve durability of the friction ring, its contact surface was treated with ultrasonic nano surface modification (UNSM) technology (principles 3, 35, 18). UNSM technology uses ultrasonic vibrations to alter the nano-grain refinement in the surface layer and improve the mechanical properties вЂ“ the surface hardness, roughness and residual compressive stress as well as fatigue strength and fatigue fracture. A tungsten carbide ball attached to an ultrasonic device strikes the surface of a workpiece 20,000 or more times per second with 1,000 to 10,000 shots per square millimeter. These strikes, described as micro-cold forging, bring severe plastic deformation to surface layers and created a nano crystal microstructure. The nano microstructure modification of the surface layer can simultaneously improve both the strength (hardness) and ductility (toughness) of the workpiece according to the Hall-Petch theory. This process also improves surface roughness and induces compressive residual stress in surface layers, which then improve the fatigue strength of the work piece. The ultrasonic apparatus shown in Figure 11 consists of piezoelectric transducer, a booster (which amplifies and transmits the vibration) and a horn. At the end of the horn, is the tungsten carbide ball, which imparts the mechanical energy to the workpiece. The booster, horn and ball gripper are made of a titanium alloy, which possesses excellent wave propagation properties and durability. The ball is made of tungsten carbide that is hard and has good wear resistance. Figure 12 shows a surface example of D2 steel before and after UNSM. Before UNSM, many sharp grinding scratches were apparent, but after UNSM, these scratches, which cause stress concentration, were removed and the surface became dimpled. Three-dimensional models of the all components were designed, analyzed and verified utilizing CAE/CAD software prior to prototyping. A ring gear, side gears and pinion gears were designed and calculated for contact and bending stress, maximum longevity and maximum torque (Figure 13). Belleville springs were also calculated and optimum dimensions were suggested using software. A differential casing and a cone-clutch element were calculated and analyzed for stress distribution and for translational displacement and are shown in Figure 14. LSD was installed in a vehicle. 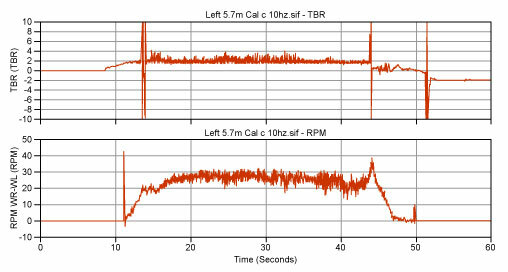 Torque sensors were mounted to both rear wheels and data was recorded to a data acquisitions system. Results of one test are shown in Figure 15. To imitate an uneven friction coefficient under the drive wheels, the car was driven over a special path where one wheel was on a slippery surface. At this point it is important to ask, "How good is a newly developed solution through the ideality formula?" The basic formula from the theory of TRIZ states the ideality is equal to the sum of useful effects over the sum of harmful effects. Any form of cost (including waste and pollution) is included in the undesired effect. System costs include occupying space, noise emission, energy consumption, etc. Design changes resulting in any combination of increases to the numerator and decreases to the denominator bring the system closer to the ideal design. Cost вЂ“ market price of the unit (approximately: $450 for existing design and $300 for new design). For the evaluation, the authors chose TBR and durability/reliability over the cost of the unit. To simplify, an assumption is made that all useful effects of existing and newly developed LSDs are the same. For convenience, the sum of TBR and durability/reliability for both (existing and new) designs is substituted with "one." Then the ratio of one over the cost is represented in a percentage. As seen in Figure 17, a newly proposed solution is closer to the ideality. It is still, however, far from the ideal result. An evolution line could read: ...<0.222 (existing) <0.333 (new) <...<1 (ideal final result). The ideality estimation in this paper is extremely simplified. Conducting a TBR analysis of the LSD in normal driving conditions would allow for a better estimate, because a preloaded status of a LSD creates not only positive but also negative effects. Determining the optimum TBR range will be a future study. During this study the authors introduced TRIZ to solving the problem with an open differential and a LSD. While describing detailed operating principles of the differential unit, they identified contradictions and discovered basic solutions through TRIZ. A non-slip differential includes solutions for the standard differential. New contradictions will arise with the new functional requirements and constrains of the system. Various types of limited slip differentials are sophisticated solutions to the existing problem. Nevertheless, analyses show that LSDs also have major problems. Contradictions with LSD are solved by the application of nano surface modifications technology and a developed solution was explained through the 39 engineering parameters, 40 inventive principles and the contradiction matrix. TRIZ is primarily used to find design parameters that are consistent with contradictions based on the technical contradiction analysis tool. The ideality of the new evolutionary cone type LSD is evaluated in a simple form here; a detailed study is planned for future projects. Thiessen, Frank J., and Dales, Davis N., Automotive Principles & Service, Fourth Edition, Prentice-Hall Inc., 1994. Forrest, James L., United States Patent, US 6261202 B1. Pyoun, Y. S., Kim H.T., Lee Y.C., Gafurov A., Kim H., Jung D.H., "A Development of Cone Type LSD for SUV/RV," FISITA, World Automotive Congress, Japan, 2006. Allen, Jim, 4-Wheeler`s Bible, Motorbooks International, November 1, 2002. Pyoun, Y. S., "Collection of Technical Papers on Development of LSD," IMST, Sunmoon University, 2000. Gilles, Tim, "Automotive Service: Inspection, Maintenance, Repair," Thomson Learning, Second Edition, February 2003. Horowitz, R. and Maimon, O., "Creative Design Methodology and SIT method," ASME Design Engineering Technical Conference, Sacramento, California, September 1997. Ross, Victor E., "A Simplified TRIZ Contradiction Matrix, Based on System Attributes", Journal of TRIZ in Engineering Design, Volume 2, Number 2, 2006. Pyoun,Y. S., Cho, I. H., "Nano Structured Surface Modification of Tool Steel and its Beneficial Effects in Mechanical Properties", Proceedings of the INSM, 2004. Pyoun, Y. S.; Kim, H. S.; Son, K. G.; Song, G. H.; Kim, M. K.; Kang, J. H.; Choi, B.U. ; Park, Jin; Cho, I. H. Kim, C. S.; Park, J. H.; and Kinney, J., "Development of D2 Tool Steel Trimming Knives with Nanoscale Microstructure," Proceedings of AIST, 2005. Pyoun,Y. S.; Kim, M. K.; Kang, J. H.; Lee, C.; Choi, B. U.; Park, Jin; Cho, I. H.; Kim, C. S.; Lee, J. H.; Park, J. H.; and Kinney, J. "Extending Service Life by Surface Modification of Local Area on Strech Level Roll in PL-TCM Line," AIST 2005 & ICS 2005, The Third International Congress on the Science and Technology of Steelmaking, North Carolina, May 9-12, 2005. Martija de Nicolas, Inigo, "Wind Energy Evolution and Expectations: a Typical Case of Gigantism," The TRIZ Journal, January 2004. Liu, C. and Chen, J. "A TRIZ Inventive Design Method without Contradiction Information," The TRIZ Journal, September 2001. Technical Report, "A study on Development of Limited Slip Differentials for Sport Utility Vehicles and Recreation Vehicles," Ministry of Commerce, Industry and Energy, 2005. Pyoun, Y. S.; Park, J. H.; Kim, H. T.; Lee, Y. C.; Kim, H.; Park, B.S. ; and Lee, S. H. "A LSD Design Utilizing CAE Tools," Symposium of KSAE, November 2005. Gafurov Alisher is currently working on his doctorate in Mechanical Engineering at Sunmoon University and is a research engineer in the Reliability Application Division of the Korea Automotive Technology Institute in South Korea. His area of interest is in design engineering with an emphasis on the axiomatic approach and TRIZ. Contact Gafurov Alisher at gafurov79 (at) yahoo.com. Dr.Young Shik Pyoun is a professor and dean of the Mechanical and Control Engineering Department of Sunmoon University. Contact Pyoun Young Shik at pyoun (at) sunmoon.ac.kr.